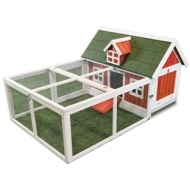 The Ware Free Range Chicken Coop Hen House is a quality hen house with country charm. 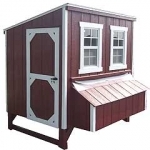 Featuring full front access for easy egg collection, a fold down side door with ramp, and a safe and secure interior nest box with predator proof lock. 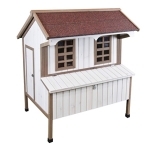 This hen house also has waterproof feet and a stylish waterproof shingle roof to help keep your birds dry. Holds 6 - 10 hens at a time.